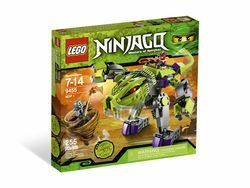 9455 Fangpyre Mech is a Ninjago set released in 2011 in the US, and 2012 in the UK. It includes a snake mech and a newly designed exclusive Scythe of Quakes. The set includes two minifigures; Kendo Cole and Fang-Suei. It features a purple flick missile on the left hand, two grabbers, a flexible body and an opening cockpit/roll cage. It is 26 cm long and 24 cm wide. The hands and legs are attached to ball joints, making the mech flexible. It has a colour scheme of green, purple and grey. The tail seems similar to the tail of 2260 Ice Dragon Attack except in the colour green. It uses new flat tiled circles and several rare purple bricks. This is a description taken from LEGO.com. Please do not modify it. (visit this item's product page) Face Fang-Suei in the mighty Fangpyre Mech! Help Cole on a mission against the mighty Fangpyre Mech! Fang-Suei has the golden Fangpyre staff in his clutches but swiping it won’t be easy. Battle Fang-Suei in the giant Fangpyre Mech with razor-sharp fangs, powerful grabbers and missile launcher! Use Cole’s special golden scythe and special Kendo armor for protection! Includes Kendo Cole and Fang-Suei minifigures, Fangpyre Mech, exclusive golden scythe and banana. Grip and grab with the mighty mech grabbers! The Scythe of Quakes included is redesigned. The January 2012 catalog states that the set includes a Fangpyre Staff, however, it does not appear in the set. Before this set was officially released, its stand-in name was "MDP 1". For some reason, the set includes a banana in place of a weapon for Fang-Suei. This set was released in December 2011 in the US. In the TV show, this and the other Fangpyre vehicles were created when Fang-Suei and Snappa bit several broken-down vehicles. Jay destroyed the mech with the Fangpyre Wrecking Ball. The banana is seen laying to the side on a trash pile on the box art. Strangely, in the TV series it is the robot Jay's parents were building, although in the set it looks more snake-themed. The set contains the 2nd new type of scythe of quakes out of the 3 new ones for 2012. This set was designed by Mark Stafford, and includes a sticker on the arm reading "NAB 11", which is a reference to Mark Stafford's online identity "Nabii". Facts about "9455 Fangpyre Mech"
Face Fang-Suei in the mighty Fangpyre Mech!